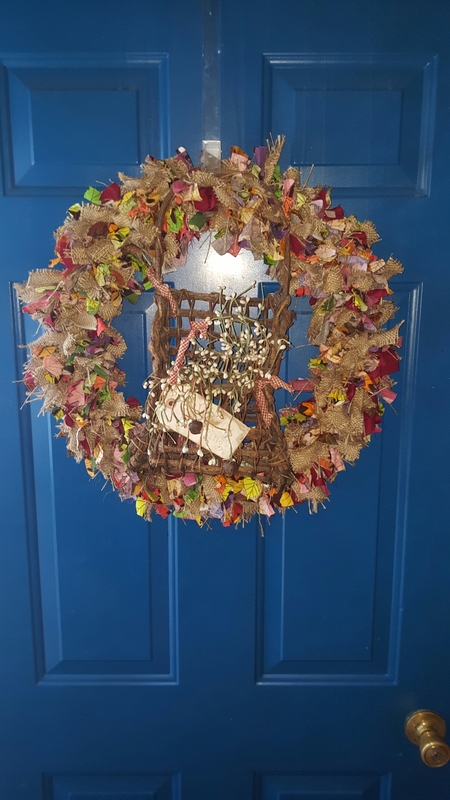 I picked up a wire wreath form at Joann craft store for a few dollars. 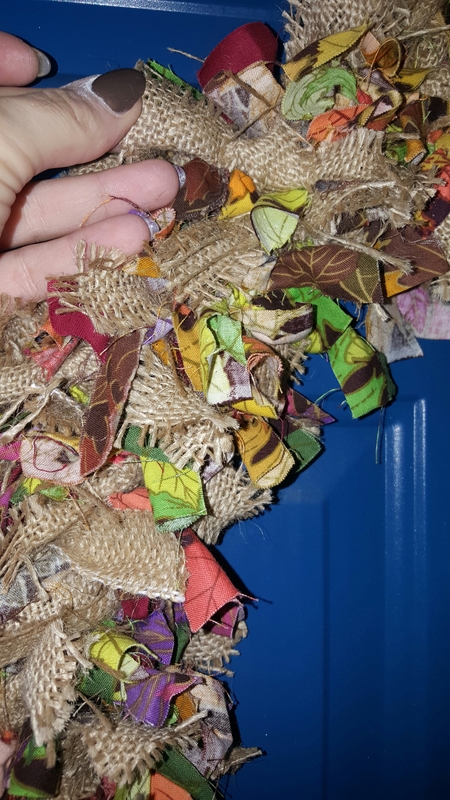 I also grabbed a remnant of burgundy fabric and a pack of colored leaf print fabric squares. I cut tons and tons and tons of fabric strips about 5 inches long. 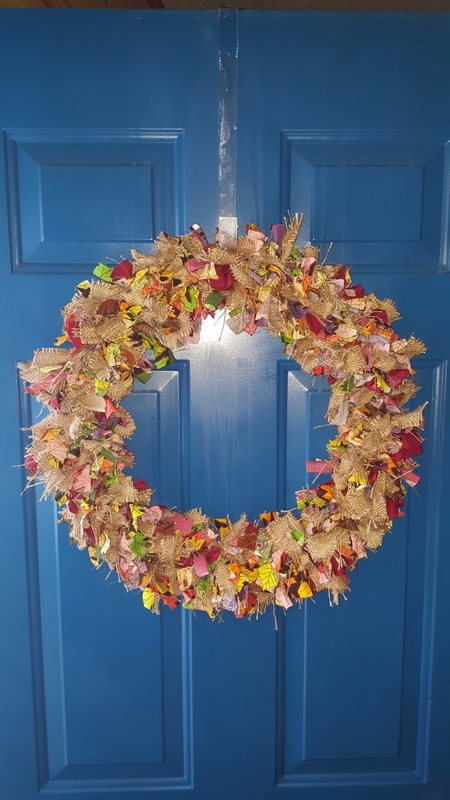 Then I tied the oodles of strips in knots around the wire wreath form. I also added some strips of burlap to give a rustic look. Simple. Here is a close up of my strips of fabric. 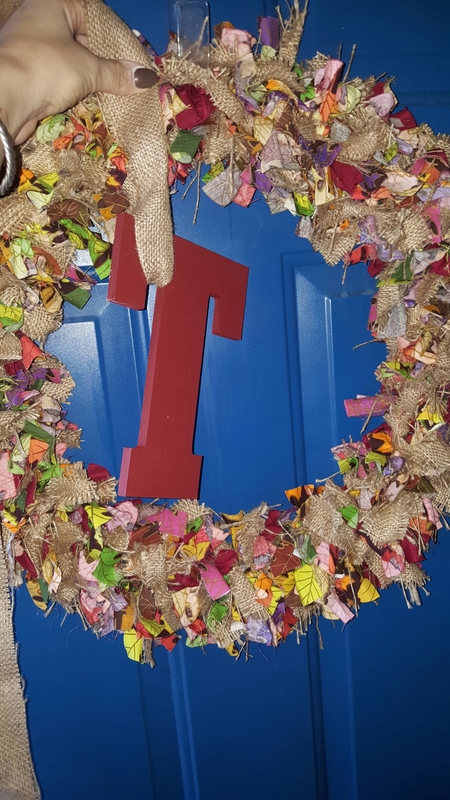 I also painted a wood letter T to hang in the center if I choose. 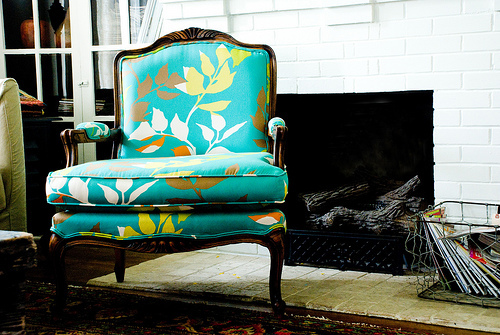 This week’s chair love is so fun! Enjoy! 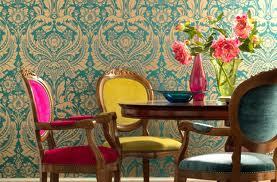 Browsing some gorgeous photos today I came across two dining room photos that I just loved. 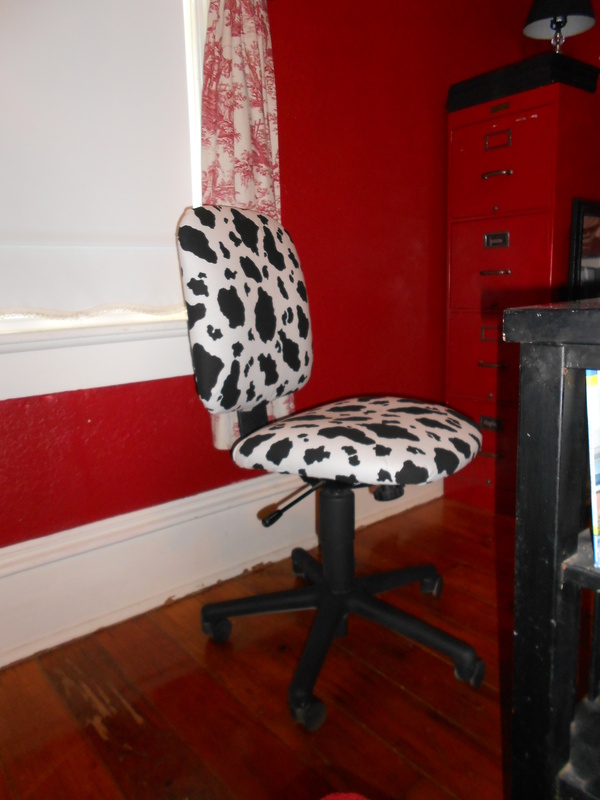 The first is so bright and fun with its mismatched chairs. I wish I was bold enough to pull this off! The next is something I’d absolutely love to try someday, with a bench being used on one side of the dining table. This bench is no regular bench, rather, a gorgeous antique bench! 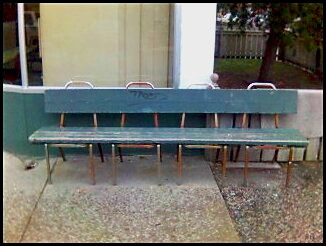 I absolutely adore that bench! Enjoy! Oh, and I want to share a peak at my Christmas holiday decor with you, but I’m running a bit behind. Still to come! Hope you all had a great holiday! The main level in our new house has a small bathroom in the laundry area (yes! ), which is super handy, but sometimes a bit wierd. 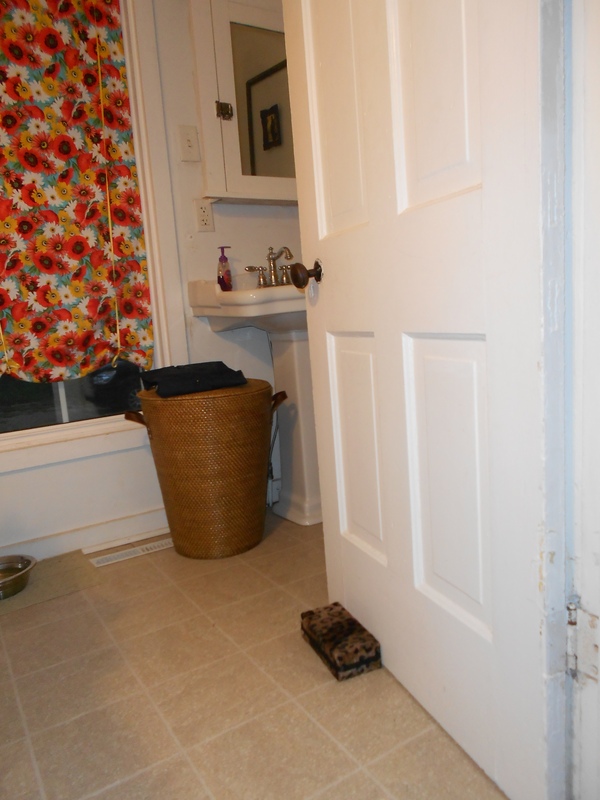 We like to leave the door at least half open so that you know the room is not occupied, but you also dont want the door flung wide open to see everything (let’s face it, even when clean, bathrooms just aren’t that appealing!). 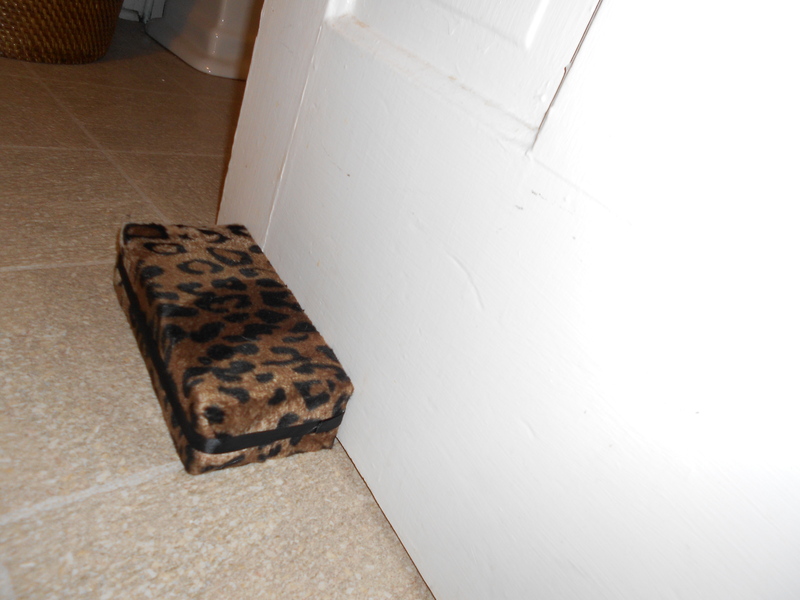 So, to stop the door from flopping about annoyingly, I made a doorstop. Cost? Free! I went out to the barn and grabbed an old brick, then cleaned it off. I used some soft, thick, scrap fabric I had on hand, and wrapped the brick like a present. I secured the fabric with a glue gun. Last, I added ribbon trim, also scrap, to the seam for a finished look… Viola! Nothing fancy, or groundbreaking, but it was cheap and does the job. I don’t think it looks half bad either, if I do say so myself! 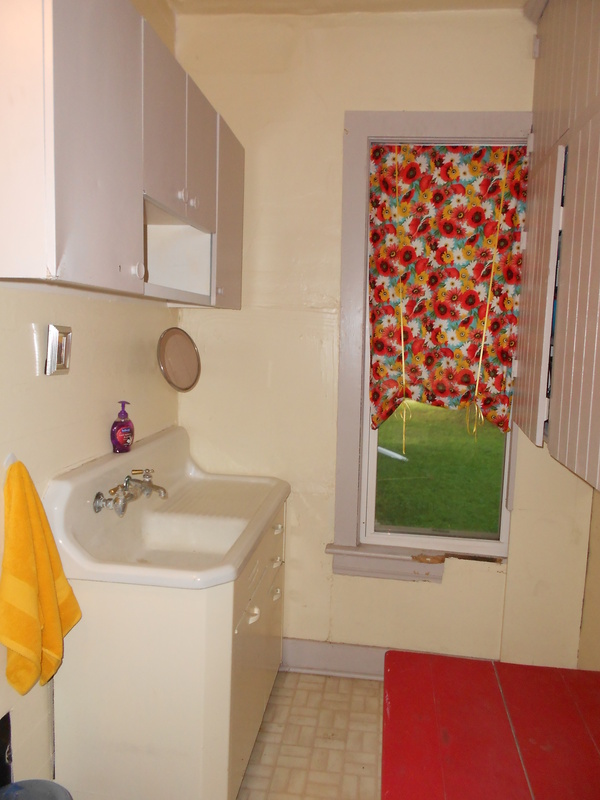 And, you get a sneak peak of the bathroom/laundry room! Just a note, if you are thinking about a project like this, it works great! I love how this thick, soft fabric slides easily and quietly on the tile floor with a scoot of the foot. I recommend! 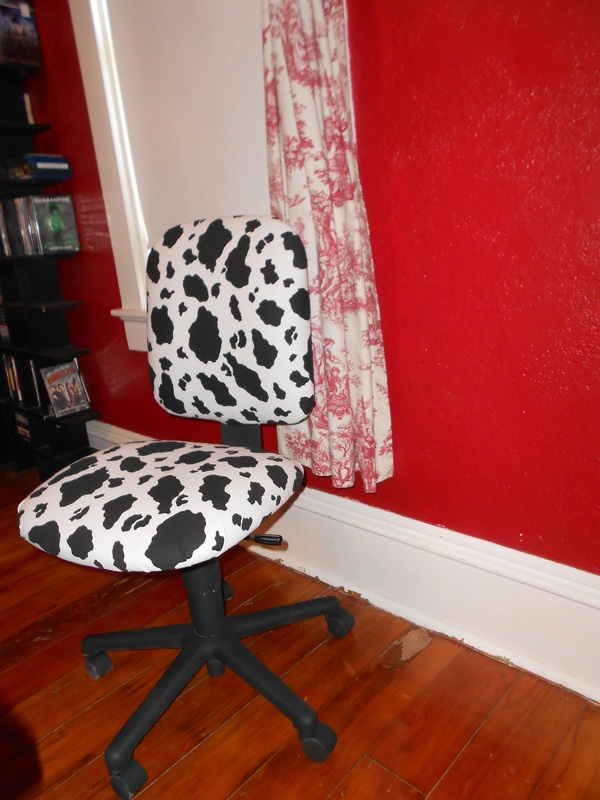 I was in an office chair conundrum at the new house. The office is large enough to hold the futon, DVD rack, desk, book shelf, and even file cabinet. But, its just not very comfortable. 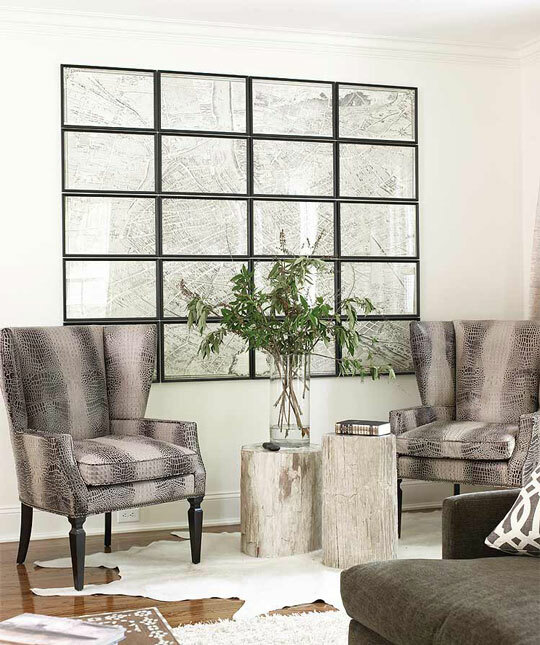 I loved using the comfy and gorgeous blue wingback chair in my last home office, but in this office there just isn’t enough space for a nice layout with the chair. So, the blue wingback moved to our bedroom. More pictures of that to come. Then there was no office chair. What to do? 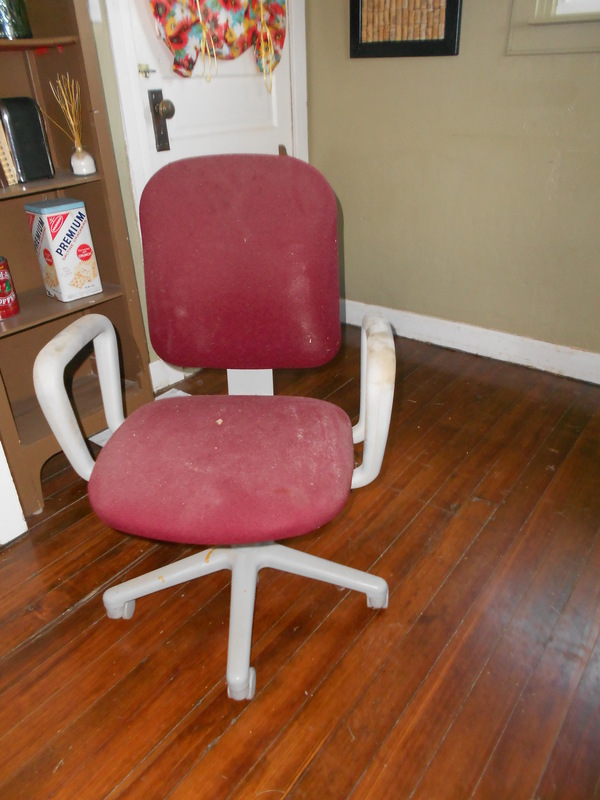 During a recent (and quick) trip down to the creepy basement to store a few boxes I noticed a computer chair with wheels! It was ugly. No other way to put it. But, it was sturdy and heavy duty, and in good shape other than the abused crudiness of it. So, what do you think? I think for being a completely free project it turned out super cute and will work for us for a while, while we have zero money. Oh, and don’t worry about the BRIGHT red walls. Come winter they will no longer be so obnoxious. 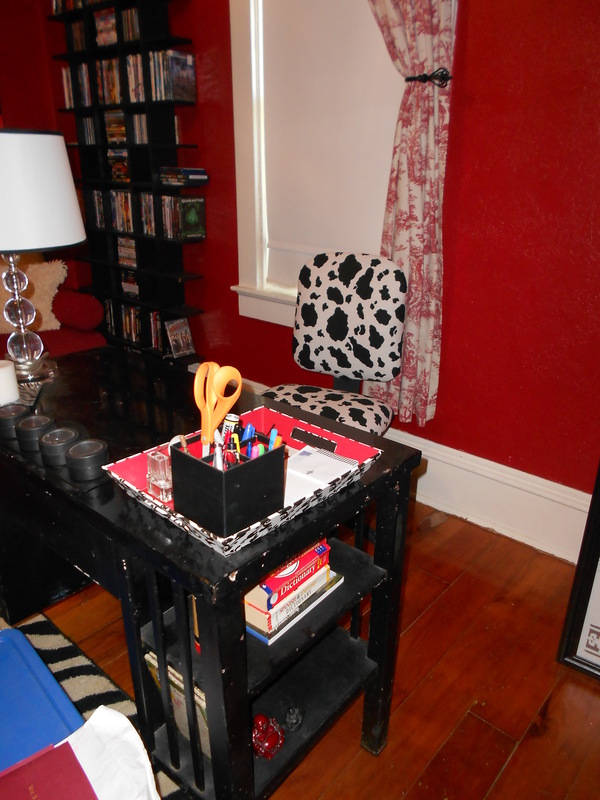 It is especially strong paired with a big red filing cabinet and on the other wall is a red futon and ottoman! lol. Every room of my new house has needed curtains. But, wow! Curtains are expensive! I always see other people’s fun curtains and think, “I can do that!” But then I get started and realize, oh yea, I can’t sew. At all. My mom suggested using iron-on fabric hem tape and making faux roman shades. Light bulb! I have a little mud room, where the dog kennels and laundry live. These blinds were broken and grimy. I thought this was the perfect place to try this experiment out on. Its a small room, so it can take a bright punch, plus we aren’t in there all the time, so if they aren’t prefect on the first try its no big deal. So, after reminding myself that the situation couldn’t get much worse, I set forth. 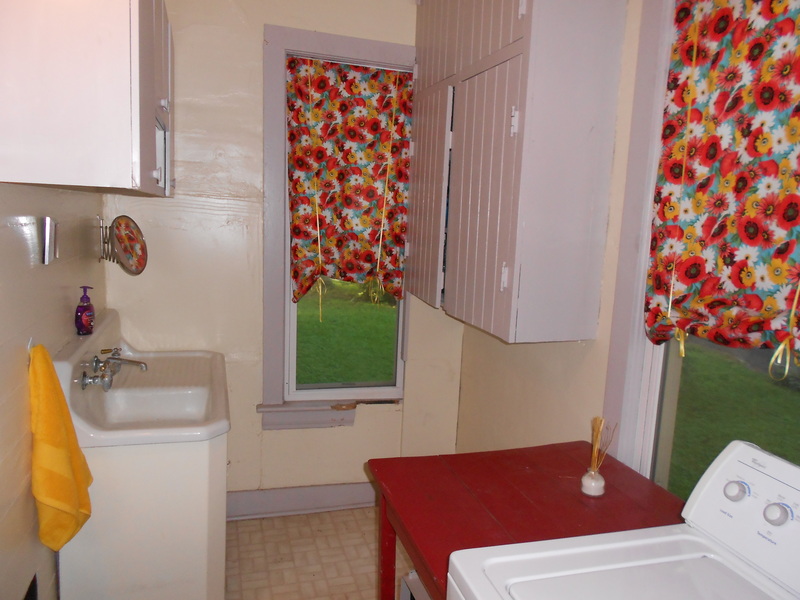 I bought a few yards of a fun, floral fabric for each window. I used tension rods, and used these to mark the width of each window. Once I had the width I used the hem tape and ironed a hem onto each side. Then ironed a hem to the bottom and a pocket at the top. I hung the curtains, rolled them up, and tied in place with matching ribbon. Viola! 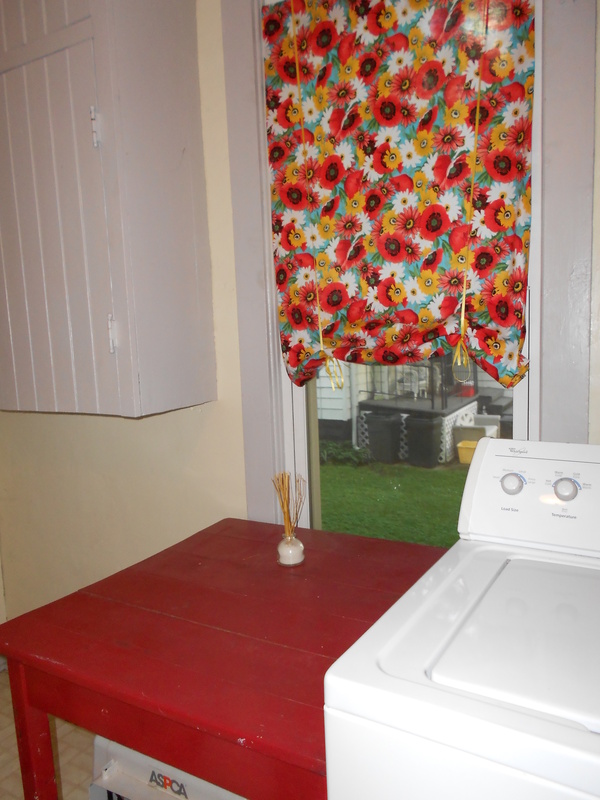 The bright fabric ties in the red antique table I use for folding laundry, and the fun towels I bought for next to the sink. You can see here that the whole little room needs some work, but for now at least the curtains are fun! What a simple technique with big impact, no? 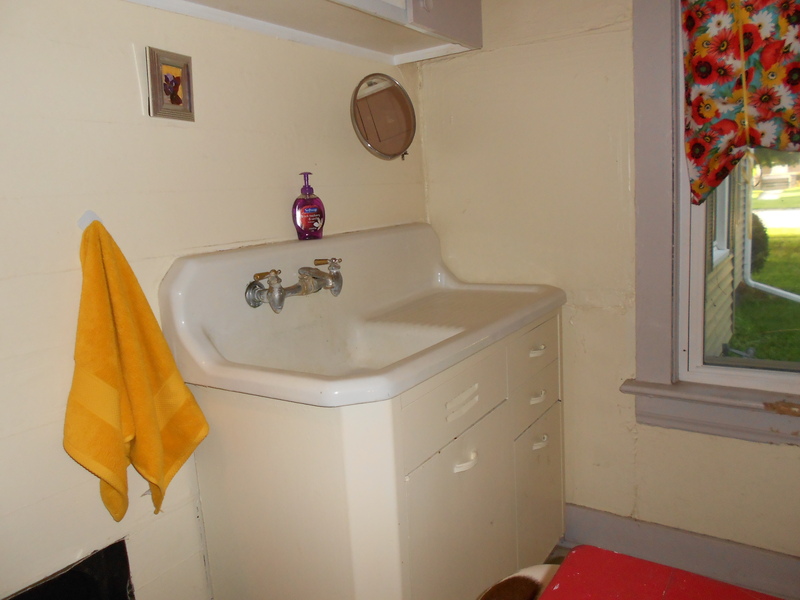 I love this big old sink, even though it needs some work too. Here you can see the little purple and yellow picture that I hung too. You can also see the antique expandable mirror. I think this experiment turned out pretty well and will definitely use this to make me braver for my next curtain project! And those chairs? I need some of those! 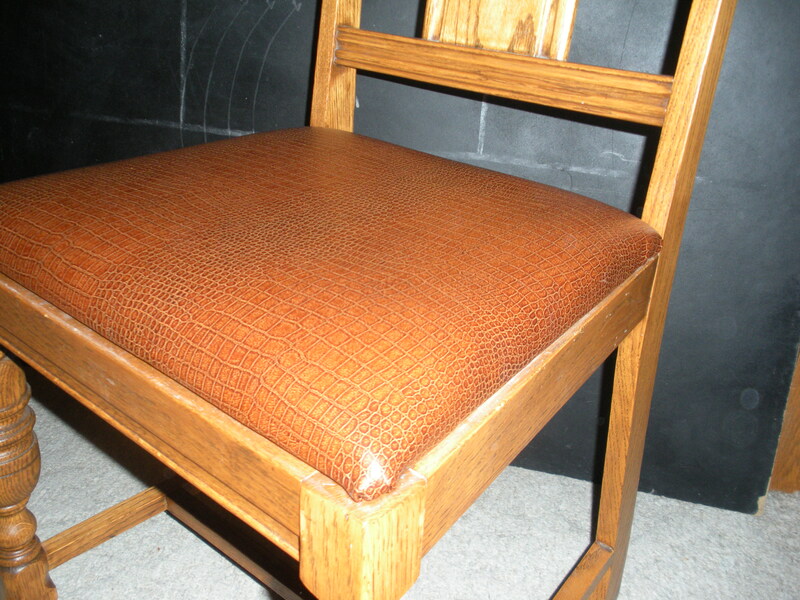 One of my many recent projects is refinishing my mom’s dining room chairs. And yes, I am finished with this one! 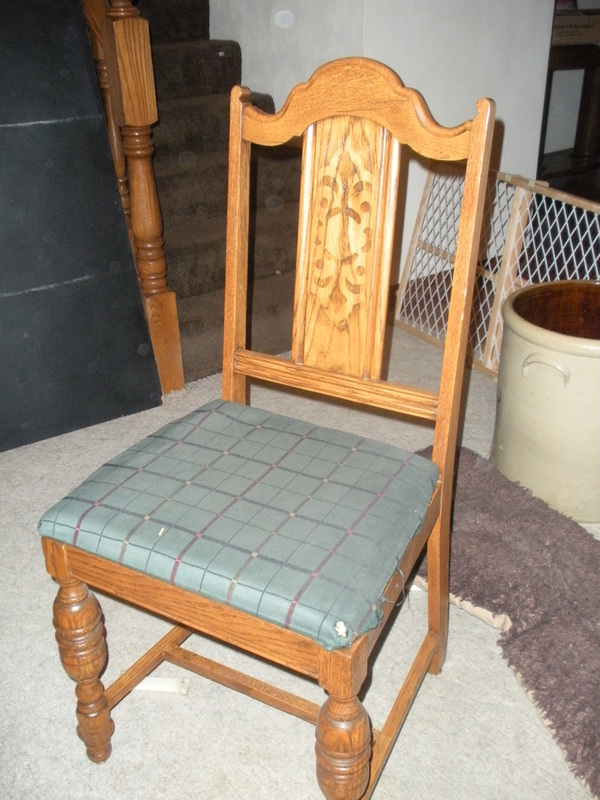 Mom has gorgeous antique wood dining chairs. 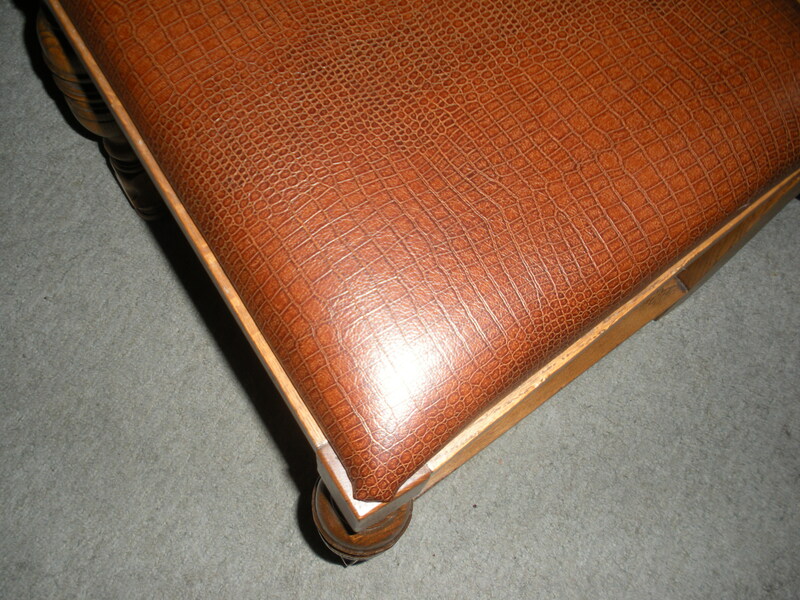 But, the cushions were reupholstered many years ago, and are now raggedy and faded. 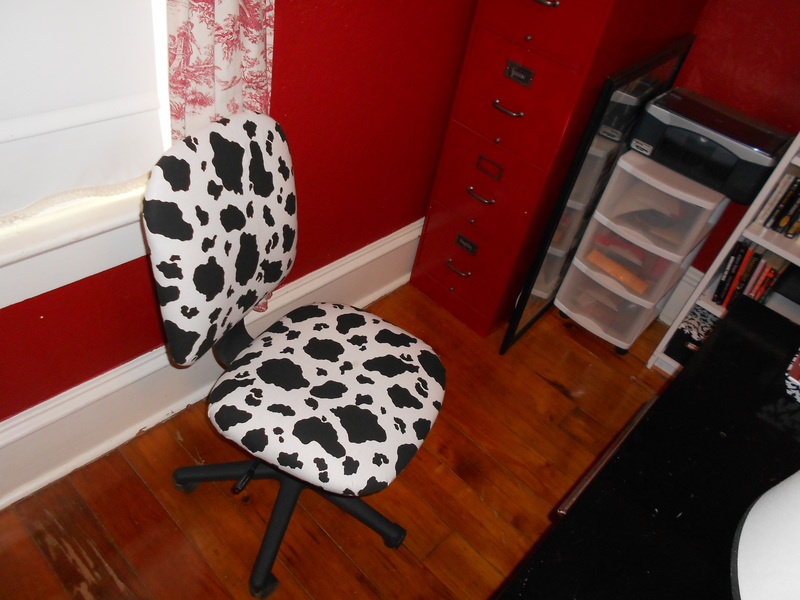 So, we bought so printed leather and I set to work. 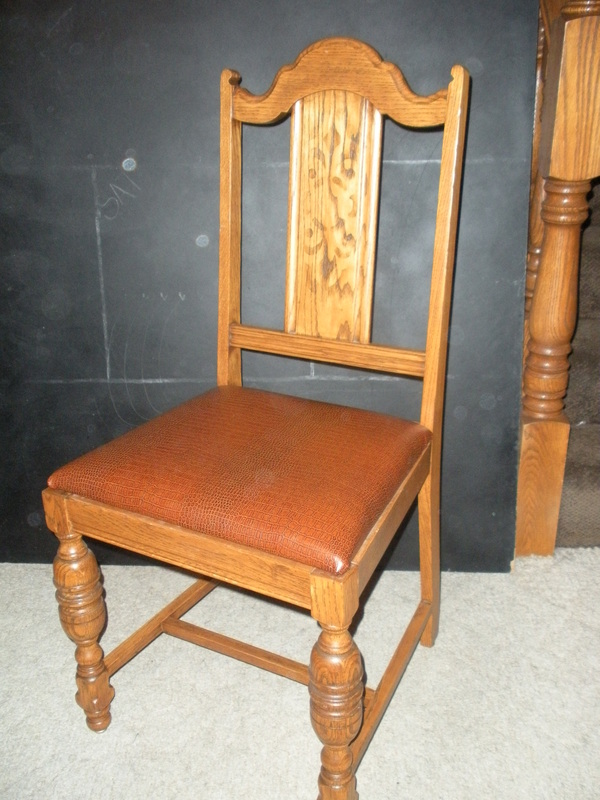 I am in the process of working on a few chair projects for the shop. 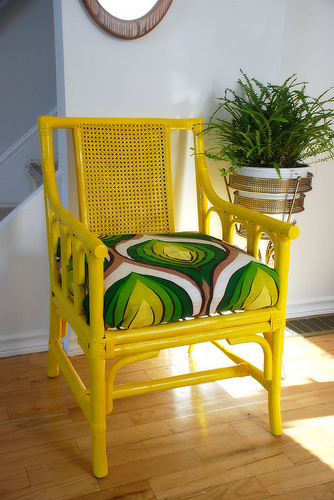 So, this week’s chair love is a compilation of some funky chair makeover inspiration! 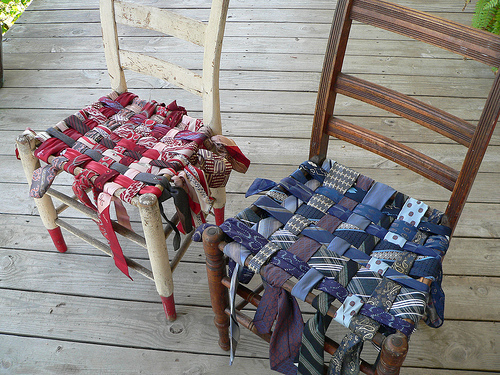 “Tie Chair Ala Alabama Chanin,” by smoothepebble. 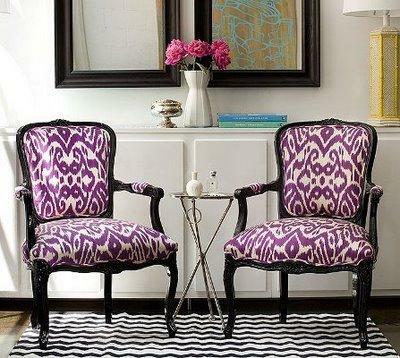 I just love these woven tie chairs, especially the ones with the dangling ends! “Painted Chair,” by kimhas6cats. So bright! 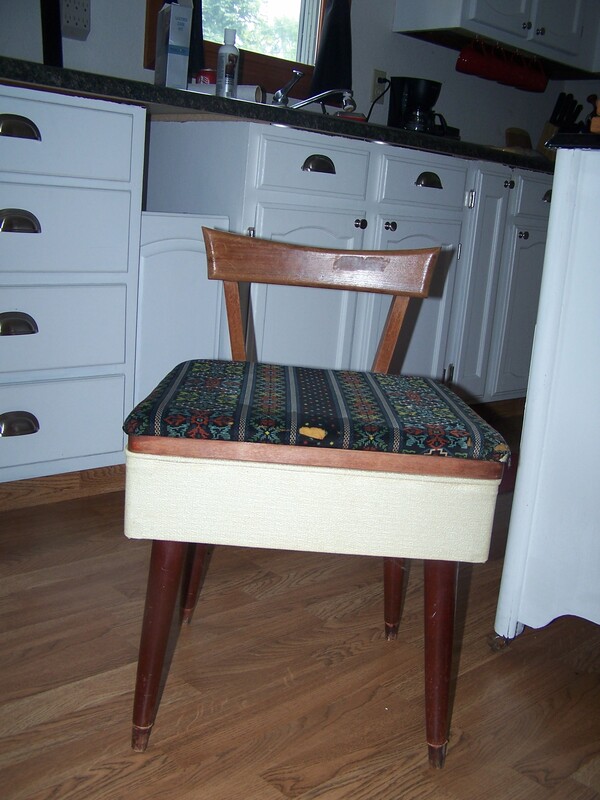 “Design Sponge Table Chair Redo,” by thirtyeight20. 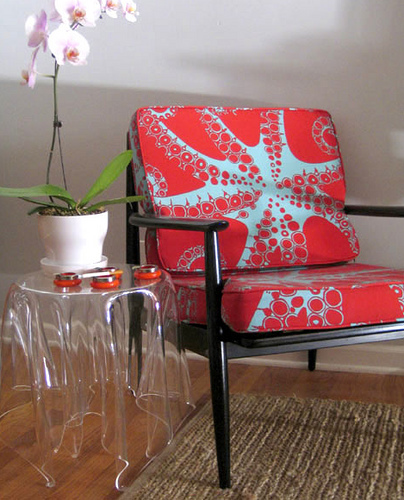 Awesome fabric choice, and, I love love that ghost table! “Fav Chair,” by k*8. 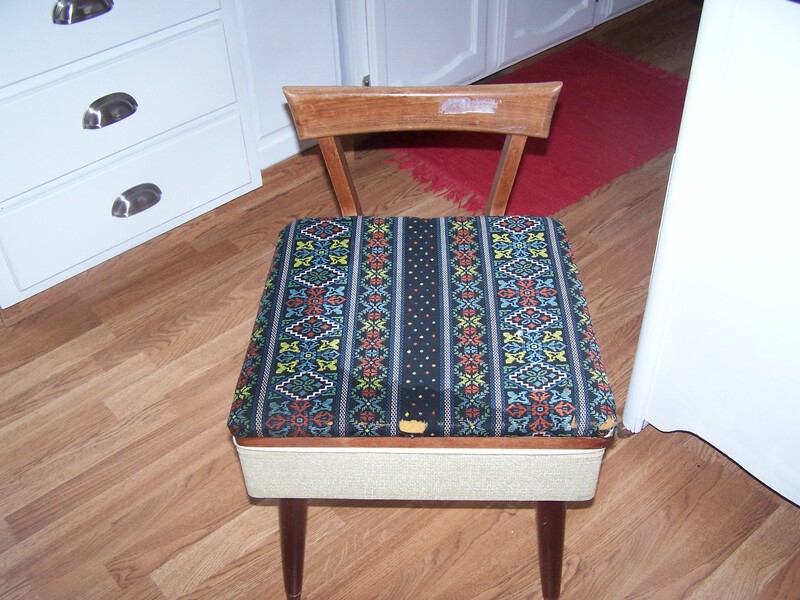 Again, great fabric gives this old chair a new life. “Chair Project 1, ” by Le Silly. 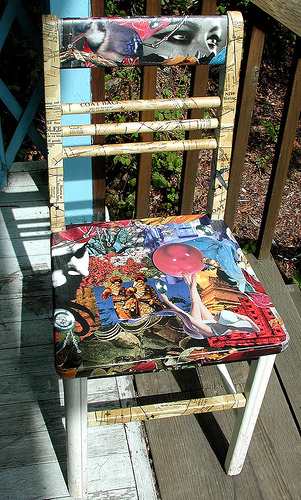 Collage on a chair can be really funky and unique. Well, for now I hope this gives everyone some inspiration… I definitely have my wheels turning! On a quick drive to Peoria yesterday to pick up some new lawn chairs I spotted the oddest, cutest little chair on the side of the road in Kewanee. On my way home it was still there, so I quickly threw it in the back of the truck and sped away! It’s so ugly right now, but I think there is a lot of cuteness potential under there! That storage could be very useful too! Some scrubbing and some new fabric… maybe even some paint? Mid century lovers should love this one when its finished, so keep your eyes peeled because it will be another shop addition!